A mass shooting was reported at the Sutherland Springs First Baptist Church 30 miles outside San Antonio TX, Sunday November 5. Currently, 27 are dead and 24 injuries are being reported with the death toll expected to rise according to Wilson County Commissioner Albert Gamaz. CEN has been in contact with our national law enforcement partners who indicate the San Antonio Federal Bureau of Investigation has now taken charge of the investigation. CEN will be monitoring information as it unfolds and will share information with our partners. While there is no hard evidence that this is part of an ongoing threat to churches nationwide, CEN advises all churches to be particularly on alert for “copy cat” type attacks. If you see anything suspicious you are advised to call local law enforcement immediately. There is no information large or small that law enforcement will not welcome. The Sutherland Springs TX First Baptist Church immediately took the first step for any ReadyChristian. The church called the local parishioners who survived and the community for prayer and they immediately professed the love and protection found only in Jesus Christ. CEN has developed three training resources to help Christians and churches, in these increasingly uncertain times, to self-organize, prepare, and mobilize all while working alongside first responders in emergencies large and small. 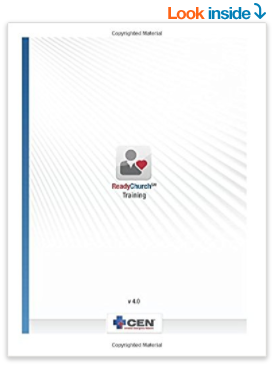 CEN equips and trains churches to have a safety security team and emergency plan in place. While churches depend upon our first responders to do their job honorably we also must do our part to protect our church and support local law enforcement. The printed version of ReadyChurch and ReadyCity is now available on Amazon. For first responders to identify the gunman and affiliations he may have had to understand his motive and restore order to the local community. For families of the survivors to experience the comfort of Jesus in the midst of this sorrow and turn this pain for good. Christians everywhere to be ready, as the Bible tells us, to give an answer spiritually, emotionally, mentally and physically if necessary to share the love of Christ in the midst of tragedy. When others ask: “Where is God in this?” Remind them of the words of the Pastor of Sutherland Springs Baptist Church, “God is here, He is with us. He is upholding us to comfort and minister as much as we can!” Send his words to someone who needs Christ. Share this CEN Alert with family and friends to stay aware of emergencies large and small that affect the Christian community. Do not rely upon secular media for details on how to respond. Stand with your fellow believers by praying, caring and sharing Christ!